Starts on Tuesday, January 8th, 2019 and will run each week for 12 consecutive weeks ending March 26th, 2019. Please spread the word and invite your fellow club members (Male, Female, Youth.....) . * The league registration, payment, and first shoot will be Tuesday, January 8th, 2019 at the indoor range. 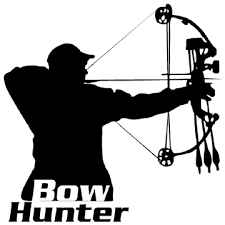 * Bow hunter league will begin Tuesday, January 8th, 2019 and will run each week (on Tuesday's) for 12 consecutive weeks ending March 26th, 2019. * The cost is $35 per Adult shooter (18 and older), $20 for youth ages 12-17 shooting on a team. Participants kids are welcome based on availability. * This league uses teams of 3 shooters. If you do not have a partner we will pair you up on Tuesday, January 8th, 2019. * The league members will start setup at 6-6:30 pm with shooting starting at 7:00 pm. Please plan on assisting with setup and/or tear down as able since this is a group effort. * Shooters will shoot 12 Rinehart 3D targets each night. Two arrows per target. Scoring is 10-8-5. * There are no makeups and the scoring computers averaging system minus a point deduction will be used for missed nights. The awards and recognitions will be provided at the clubs banquet in April (date yet to be determined). * Bow Hunter League scores and updates to rankings will be posted on the bulletin board at the indoor range following each Tuesday night (except for the final night). We will also post this information on our club website (www.Minnehaha-Archers.com) . * Should we end up with a cancellation because of a snow storm etc. we will make an effort to post this on our club website (www.Minnehaha-Archers.com). Matt Schrader 951-2745, Brian Tanner 215-3940, Rick DiSanto 321-1883.